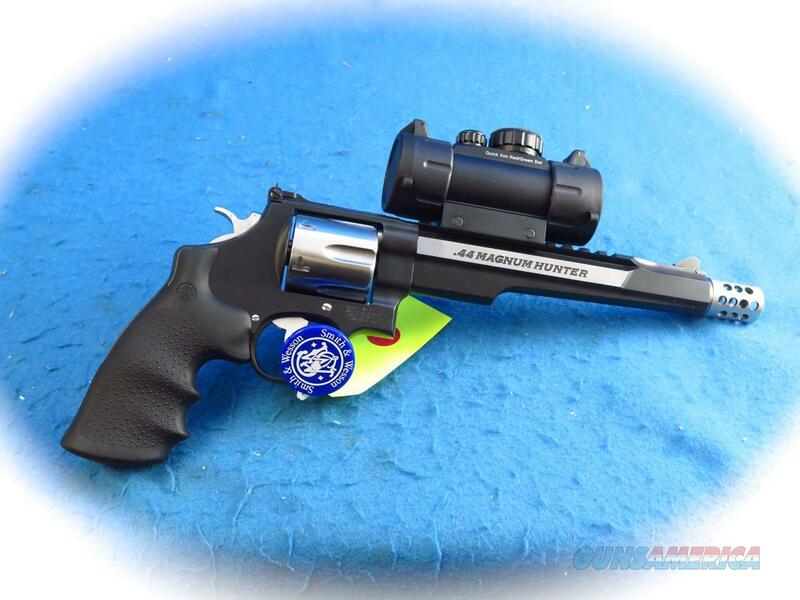 Description: Smith & Wesson Performance Center Model 629 .44 Magnum Hunter, SKU 170318. Performance Center firearms originate from standard designs or are created from the ground up. From hand-cutting and fitting to fine-tuning for precision, these firearms are top performers. Products from the Performance Center are the ultimate expression of old-world craftsmanship blended with modern technology. This firearm has all the bells and whistles you would expect from our Smith & Wesson Performance Center®, such as a custom-tuned action for which our Performance Center is well known. The handgun is constructed from all stainless steel, and has a two-tone finish that sets it apart from our standard products. The barrel has a few unique options like the dovetailed front sight, integral Picatinny rail, and of course the custom muzzle brake. The best feature of all is the Red/Green dot optical sight that ships with this ultimate hunting handgun.